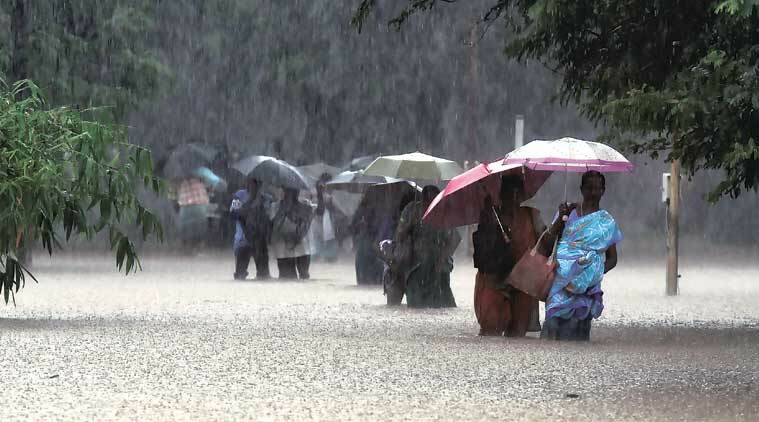 Heavy rains today pounded several parts of Tamil Nadu and inundating most areas of Chennai, severely disrupting flights, train and bus services and forcing postponement of half-yearly school exams even as the state braced for more showers in next four days. As the death toll in rain-related incidents touched 188, Chief Minister Jayalalithaa reviewed the situation and deputed ministers to inspect the affected regions. Puducherry and its suburbs continued to be lashed by heavy rains since last night and it recorded 15.2 cm rain in the last 24 hours ending 08:30 hours today. Two columns of army’s Garrison Infantry Battalion have been pressed into service in Tambaram and Urapakkam after the Tamil Nadu government sought military assistance. The Navy is also on stand-by. Rescue work will begin and NDRF would deploy more teams if required. Teams carrying boats will also be sent to Kancheepuram and Tiruvallur districts. After pounding and battering the city for a month, heavy rains resumed overnight on Monday after a brief break for four days. For the 24 hours ending 8.30 a.m. on Tuesday, the rainfall level recorded in the city was 3 centimetres. Between morning and noon, the city received more than 8 centimetres, officials said. Suburban train services on the Chennai Beach-Tambaram sector were crippled. Services on the Chennai Central-Tiruvallur sector were also disrupted. Arterial roads were flooded and traffic was affected. Heavy rains lashed parts of Tamil Nadu, including Chennai, and neighbouring Puducherry, disrupting flight movement and leaving several areas inundated. The picture looks no better for Wednesday with the weather office forecasting heavy to very heavy rainfall for Tamil Nadu, especially over the northern districts of Chennai, Tiruvallur and Kancheepuram. It also forecast heavy rains for Puducherry. “The trough of low pressure now lies over Southwest Bay adjoining Sri Lanka off Tamil Nadu,” officials at the Regional Meteorological Centre (RMC). Under its influence, widespread rains are expected across the State on Wednesday, with the possibility of “scattered heavy to isolated very heavy rainfall over coastal districts,” they said. The weather office forecast “isolated extremely heavy rainfall” for Chennai, Kancheepuram and Tiruvallur which have been already been facing the brunt of the northeast monsoon since last month. Chennai Floods: City crippled, all flights cancelled, Army, NDRF deployed, Helpline Nos.